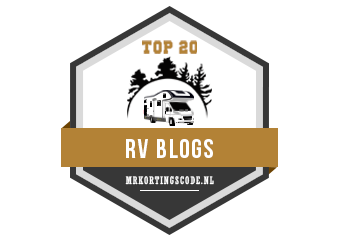 When undertaking an electrical project for your caravan or motorhome one key consideration is what type and size of cable to use. Selecting a cable that is too small for the task and you might risk melting the cable insulation or damaging equipment due to voltage drop. Given as mm², it describes the total cross-sectional area of the copper conductor. Cable will be sized 1 mm², 2 mm², 4 mm² etc. and may be written as 1 mm, 2mm, 4mm. This is not the diameter of the cable. Usually given as 19 x 0.41 or 19/0.41 which decoded means 19 strands of 0.41 mm diameter wire. Always given in amps for the cable at a standard temperature (20 Deg.C) in free air. If you bundle cables or install them in conduit you have to down grade the current rating. Each manufacturer will have charts for this. It is unlikely though for moat projects in caravan’s or motorhomes you will need to factor this in. This is the overall diameter of the cable including insulation. Don’t confuse cable diameter with cross-sectional area. Lets start by looking at cable construction. 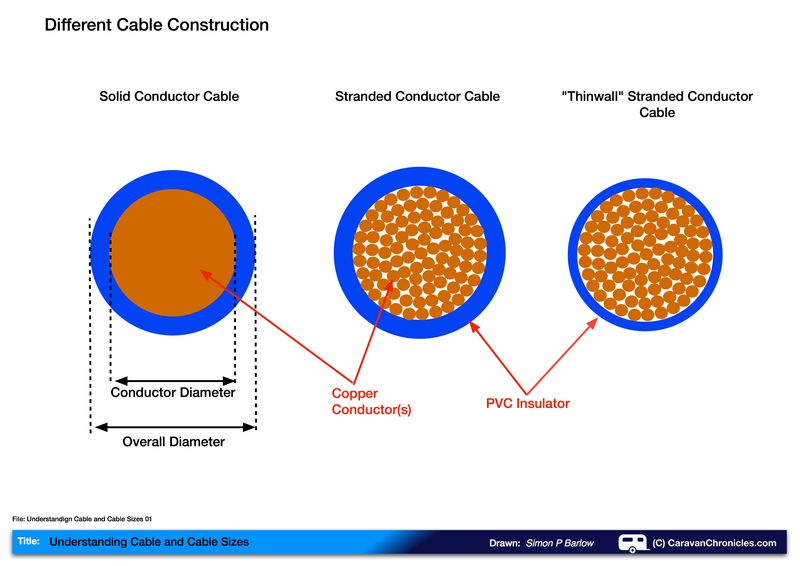 Cable comes in two main types, solid and stranded conductors. Solid conductor cable is usually reserved for the cables installed in domestic and industrial buildings. It is not a flexible as stranded and therefore should never be used where vibration or movement could disturb the cable. Copper work hardens with flexing becoming brittle and eventually will crack creating a higher resistance at the fracture point and could lead to overheating. Stranded conductor cable, sometimes called “flex” in the UK or “cord” in the USA, is built up of dozens of thinner strands of solid copper conductors. These smaller diameter strands allow the cable to bend easier and slide over each other inside the PVC insulation so that the bending force and stress is reduced. However repeated bending will damage the cable over a long period and may cause the individual strands to break within the cable reducing its overall cross sectional area and ability to carry its rated current creating a hot spot. Thin wall cable has a thinner layer of insulation – as its name suggests, it is usually made from a higher grade of insulating material. It’s generally lighter and the insulation is denser and more resistant to impact damage and abrasion. The insulation also has a higher melting point (see “Insulation” below) of around 105° C. Because of the benefits It’s been adopted by nearly all the vehicle manufacturers. The down side is it’s less flexible and sometimes unless you have the right cable stripping tool it can be difficult to strip the insulation off the conductor when making terminations. Thin-wall cable made from special coverings – Kynar (Arkema) and Kapton (DuPont) are commonly used in aviation. Some stranded copper cable is tinned (looks silver when you strip the insulation off). Tinned cable is usually used where corrosion has to be taken into consideration, such as marine use. If ordinary copper cable is used, the copper conductors turn a dull brown or in severe cases green at the terminations. This surface corrosion can ‘seep’ back up the cable and the only way to solve the problem is to cut off the end of the cable back to bright copper and re-terminate. Using adhesive lined heat shrink tubing over crimp connectors can help in slowing the effects of corrosion but not eliminate it. Number of strands in a cable. The more strands in the cable, the more flexible and kink resistant it is going to be but also the cost will increase. The lowest number of strands is 7 – one in the middle surrounded by 6. The next is 19 which is one in the centre surrounded by 6 surrounded by 12. This can sometimes be found being used as battery cables. 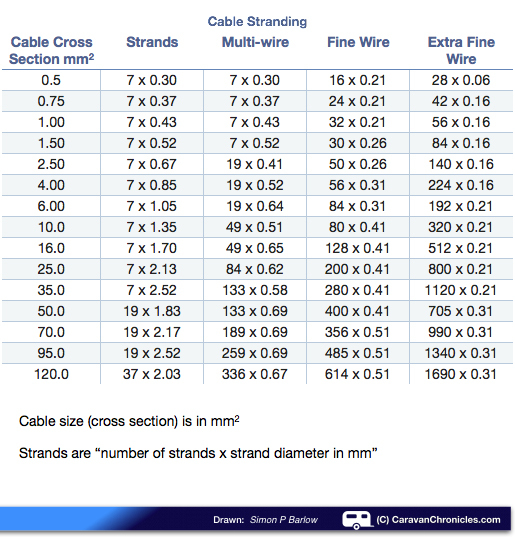 These figures are for typical cables from one manufacturer. They do sometimes differ in strand count and strand diameter depending on country of manufacture and quality of copper. Typically “Multi-Wire” or “Fine Wire” is used for caravan, motorhome or automotive use. Cable that is manufactured in America is sized using AWG – American Wire Gauge (sometimes referred to as “Brown and Sharp” Gauge) Increasing gauge numbers denote decreasing wire diameters. OK, this is the bit you have been waiting for! right there are two things that you have to consider when selecting a cable size. The first is the load that the cable has to supply and the second is the length of the cable. Both these have an influence on the cable size. On the face of it, choosing the cable size should be easy… there are charts that state “For this size cable the maximum current is X”, but hold on a minute there is a bit more to it. All cable has a resistance and it’s given as ohms per metre – “W/m”. Some manufacturers give this figure, however others give the voltage drop expressed as “mV/A/m” ) milli-Volts per Amp per metre . You have to make sure your using the right figure for the calculation. Think of the brake lights on your caravan. We have a 1.0 mm² cable connected to a battery that is 12 metres long that needs to supply two light bulbs that have a total load of 50 watts at 12 volts, how do we work out the voltage drop? OK, here’s a worked example using both methods… the answer will be the same I promise ! Vdrop x Current x length of cable in metres and divide by 1000 (to convert mV into Volts). Vdrop = 38 mA/A/m x 4.17 Amps x 12 metres = 1901.52 mV / 1000 = 1.901 Volts. I told you the answer would be the same! Easy bit coming up… of course we have to calculate the voltage drop on the neutral cable and if we use the same size cable – 1.0mm² the voltage drop will be identical – 1.901 Volts, giving a total of 3.802 volts. So we can see that although the cable size, 1.0 mm² is rated to handle the 4.17 amp load, if we used that cable the voltage drop would be excessive. As a rule of thumb, the voltage drop should be no more than 3%. In our example it’s 31.6%. Vdrop = 38 mV/A/m x 8.34 Amps x 12 metres = 1901.52 mV / 1000 = 3.803 Volts. Choosing the right size cable is not difficult now you understand some of the principles behind your choice. Try and keep the voltage drop below 3% and always make sure the fuse that protects the cable is rated at, or below the cables rated current capacity. Stick to those rules and you should not have any problems.